Have you ever had your car serviced and felt as though you are just another number on their list of things to do? Have you ever felt that your business wasn’t really appreciated? Maybe you’ve left feeling like you don’t really understand what you paid for. At Master Mechanic, we understand the frustration that comes with these feelings and that’s why we go out of our way to ensure our customers always feel appreciated. There’s no better example of this than our Ajax location. 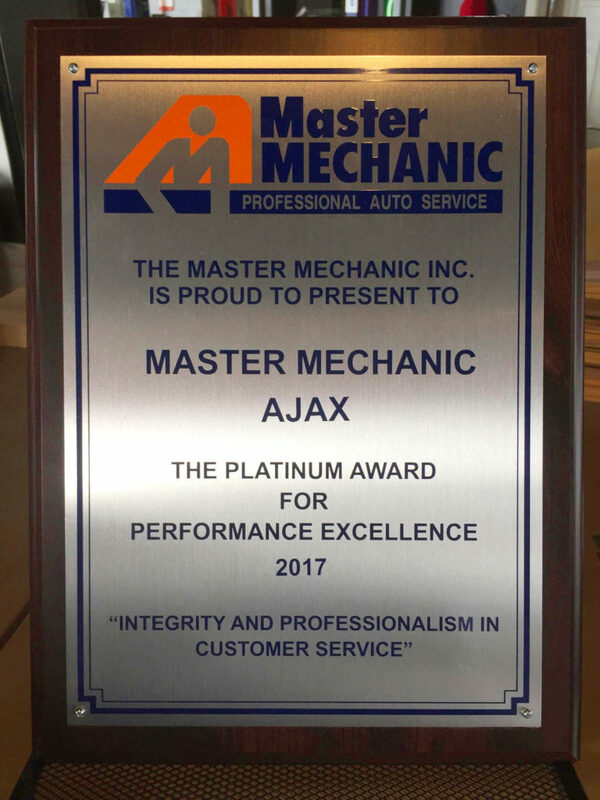 Master Mechanic Ajax recently won our Platinum Award for Excellence for “integrity and professionalism in customer service.” Their hard work and dedication to each customer is recognized in their positive reviews and feedback. Congratulations to the team at our Ajax location! Mike Sementilli is our local Ajax Master Mechanic. Mike takes pride in the work he does and has demonstrated the value of genuine customer service in his everyday operations. Mike goes above and beyond. He leaves little mints in his customers’ cars and makes sure he follows up after each visit with a phone call or email. As a result of this exceptional customer service, the Ajax Master Mechanic location has received a 4.9 Google Star Rating! To consistently achieve such high positive ratings is only possible when you truly care and appreciate each customer as much as Mike does. Unfortunately, a few unreliable mechanics have given the automotive industry a negative reputation – especially when customers don’t have a strong background in how their vehicles work. Mike makes sure each customer understands the purpose and function of their vehicle; he individually explains exactly what customers are paying for and ensures they leave feeling they’ve received satisfactory service on each visit. Why Does Genuine Customer Service Matter to Us? While it may take a little more time and energy to provide genuine customer service, it truly pays off in the long run. Customers are more likely return if they feel valued and well looked after. Likewise, if customers feel they’ve received top quality service while forming a good relationship with our team, they’re more likely to become loyal clients and even refer us to their friends and family! We value our customers and retaining your loyalty is highly important to us. We feel there’s no other way to do business than to provide genuine customer service. At Master Mechanic, we always take the time to get to know you! Our number one priority is to make you feel appreciated and we do our best to let you know that we genuinely care. After all, good business is all about great relationships. Don’t believe us? Experience the difference yourself! Visit Mike at Master Mechanic Ajax for all your auto repair needs.